London, 11 July 2018: eMarketer has released its ranking of the top 10 ecommerce retailers in China. Combined, the retailers on this list will account for more than 85% of all retail ecommerce sales in the country this year. 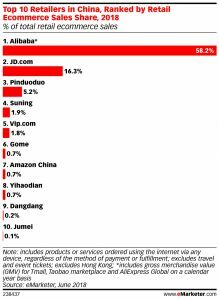 As expected, Alibaba will take the top spot, with a 58.2% share of all retail ecommerce sales. JD.com will rank second with a 16.3% share. Over the past few years, however, the dynamic marketplace in China has welcomed some new players that are offering branded products, which are popular with consumers. This has meant that smaller, more specialist players that can offer “authentic” goods have become credible competitors to Alibaba and JD.com. Pinduoduo, or PDD, a Groupon-style retailer that mixes in social buying, will rank third behind Alibaba and JD.com this year with a 5.2% share. That’s up from a 0.1% slice of the market when it launched in 2015. Started by a former Google engineer, PDD allows consumers to buy direct from wholesalers and factories at competitive prices. A key factor in PDD’s success to date is that it has targeted Tier 3 and Tier 4 cites in China, thus attracting new price-conscious ecommerce customers. In addition, PDD has made it relatively easy for sellers to enter the marketplace. Gome, an online and offline multichannel retailer that specializes in home goods, will take a 0.7% share of all retail ecommerce sales in China this year. The company, which employs social sharing as part of its marketing strategy, has also begun to use its online data to support its offline offerings. Suning, primarily an electronics retailer, has been exploring multichannel integration over the past few years. This approach has proved profitable so far, and the company will account for nearly 2% of retail ecommerce sales in China this year. Vipshop, or vip.com, is an online discount retailer focused largely on fashion that offers high-quality and popular branded products. Founded in 2008, the company focuses on flash sales and has partnered with well-known players such as Tencent (owners of WeChat) and JD.com. The company has built a sizable base of loyal customers, and we expect vip.com will take a 1.8% share of the retail ecommerce sales market in China this year. “China’s smaller cities such as Tier 3, Tier 4 and lower are less urbanized than Tiers 1 and 2, but they are growing rapidly in ecommerce participation as digital buyers in those cities begin to seek out the benefits of more affordable yet genuine products online,” said Monica Peart, eMarketer’s senior director of forecasting. “Smaller ecommerce players such as relative newcomer Pinduoduo have benefitted from this trend as buyers in lower-tier cities have been less tolerant of the higher prices found on large players such as Alibaba and JD.com, but they are quick to seize upon the relative deals found on Pinduoduo’s platform,” she said. Founded in 1996, eMarketer is the first place to look for research about marketing in a digital world. eMarketer enables thousands of companies worldwide to understand marketing trends, consumer behavior and get the data needed to succeed in the competitive and fast-changing digital economy.eMarketer’s flagship product, eMarketer PRO, is home to all of eMarketer’s research including; forecasts, analyst reports, aggregated data from 3,000+ sources, interviews with industry leaders, articles, charts and comparative market data. eMarketer’s free daily newsletters span the US, EMEA and APAC and are read by more than 200,000 readers globally. In 2016 eMarketer, Inc. was acquired by European media giant Axel Springer S.E.